"Companies and research labs worldwide are racing to develop Dense Wavelength Division Multiplexing (DWDM) technology, a far-reaching advancement in the fiber optical communications field. To help you keep pace with these latest developments, this all-in-one resource brings you a clear, concise overview of the technology that is transporting and processing vast amounts of information at the speed of light. 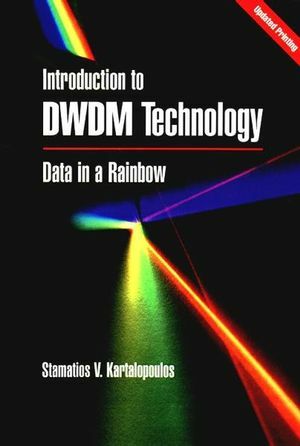 Until now, no book offered a practical introduction to DWDM advances. Complete with four-color illustrations to show how devices work, this comprehensive book provides an invaluable discussion of DWDM basics necessary for practicing electrical engineers, optical systems designers, technical managers, and undergraduate students in optical communications. Stamatios V. Kartalopoulos is currently on the staff of the Optical Networks Group of Lucent Technologies, Bell Labs Innovations, formerly known as AT&T. His research interests include ATM and SONET/SDH systems, ultrafast pattern recognition, IP and DWDM, access enterprise systems, local area networks, fiber networks, satellite systems, intelligent signal processing, neural networks, and fuzzy logic. He holds several patents of which six patents (and six pending) are in communications and optical communications systems." About the Author Stamatios V. Kartalopoulos is on the staff of the Advanced Optical Networking Center of Lucent Technologies, Bell Labs Innovations. His research interests and expertise include DWDM, IP, SONET/SDH and ATM systems and networks, ultrafast pattern recognition, access and enterprise systems, local area networks, satellite systems, protocols, intelligent signal processing, neural networks and fuzzy logic, control architectures, multitasking, and VLSI design. He has led and managed teams in these areas. He holds several patents, six of which (and eight pending) are in communications and optical communications systems. Dr. Kartalopoulos is the author of Understanding SONET/SDH and ATM (IEEE Press, 1999) and Understanding Neural Networks and Fuzzy Logic (IEEE Press, 1996). He has published widely on the subject of networks and optical communications systems. Interaction of Light with Matter. The Optical Waveguide: The Fiber. Optical Spectral Filters and Gratings. Digital Transmission and Coding Techniques. DWDM CURRENT ISSUES AND RESEARCH.